Hunt down a wide variety of exotic monsters, from savage beasts prowling mountain passes to cunning supernatural predators lurking in the shadowy back alleys of densely populated cities. Trained from early childhood and mutated to have superhuman skills, strength, and reflexes, witchers are a socially ostracized counterbalance to the monster-infested world in which they live. Fallout 4 GOTY Edition Ps4 Game. 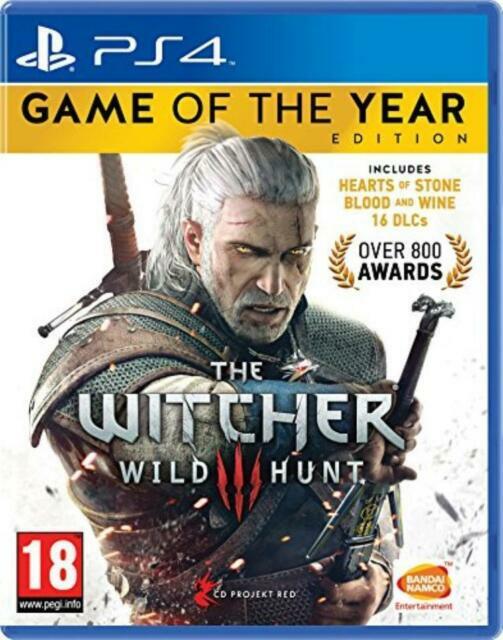 The Witcher 3: Wild Hunt Game of the Year Edition collects the critically-acclaimed action fantasy RPG together with additional downloadable content. In this open-world adventure, you play as monster hunter Geralt of Rivia, searching for your adopted daughter in a dark fantasy world. The Game of the Year Edition includes two expansions, Hearts of Stone and Blood and Wine, as well as additional downloadable content. Game features all expansion packs and DLC, making this purchase great value for money. It also looks great graphically, and stands up to current titles despite being originally released in 2015. The greatest RPG and one of the best Games created. The fighting isn't as fluid as some other games but to be honest that's not the main point of the game IMO. You have to make decisions that influence the future of the story, you have to search for clues in books and notes to find weaknesses in certain monsters, make specific potions for each battle. Very gripping. Plus Gwent the cardgame is quite challenging for someone new to it like me. For £20 you can get a game that you can play for looong hours. Highly recommend. Great story and gameplay not for impatient as there is many tasks and many attacks types depending on the beast or human. U can get lost in it for hours. Puts a lot of developers to shame! This is how a GOTY should be, everything on the disc; including all patches. So when you boot up the game you don’t have to download a plethora of nonsense or use download codes Example: Fallout 4 GOTY edition. I played the base game on release and easily sunk 200+ hours. It was atmospheric and always pulled me back. Shamefully I sold my PS4 due to pet reasons and always wanted to complete this masterpiece. Roll on 2018 1st January and my goal is too finally complete and appreciate this masterpiece on Death March mode difficulty. Also the price alone is a bargain! A masterpiece that all players should at least try.